A synthesis of the results of a major series of excavations and watching briefs is offered in this volume, in which a series of six discrete excavation reports is followed by single chapters presenting environmental information and a concluding discussion. 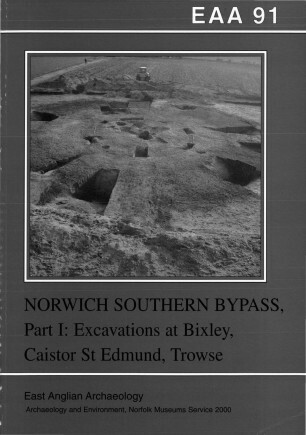 A series of three cropmark ring-ditches dating to the 3rd/2nd millennia BC were excavated at Bixley. At Harford Farm, Caistor St Edmund, five more ring-ditches were excavated, along with evidence of Middle Iron Age occupation, an intriguing series of square-ditched enclosures probably of Late Iron Age date, and an important Middle Saxon cemetery (published separately as EAA 92, see below). Prehistoric occupation sites were excavated at Valley Belt, Trowse; at the Frettenham Lime Co. Quarry and at Markshall, Caistor St Edmund — that at Trowse comprising Early/Middle Iron Age pits, four-post structures and enclosure boundaries, and an important pottery assemblage. Outstanding prehistoric finds from the watching briefs included a dump of later Bronze Age pottery possibly representing kiln waste, and a hoard of three socketed axes dating to the earlier 1st millennium BC. 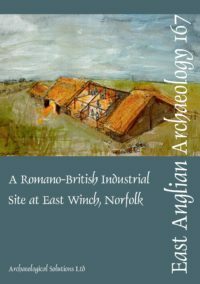 The concluding discussion assesses the results in the context of previous research nearby, notably at the Arminghall Henge and at Roman Venta Icenorum (Caistor St Edmund). For Part II see ANGLO-SAXON.